AGOFREDUS, a brother of St. Leutfrid (vide infra), and monk at the Abbey of La Croix Saint-Ouen where St. Leutfrid was Abbot. St. Agofredus was known throughout Normandy for his holiness of life. He reposed 738. ALBAN, a Greek priest from Naxos exiled by the Arians, St. Alban ended up in Mainz where he evangelised the locals, and continued his preaching against Arianism. St. Alban was martyred at Mainz by invading Vandals circa 400. CORBMAC, (Sixth Century), St. Corbmac was a disciple of St. Columba (9th June) who made him Abbot of Durrow in Co. Offaly, Ireland. Nothing further is known about his life. CYRIACUS and APOLLINARIS, (Date Unknown), these two saints are listed in the martyrologies as having been martyred in North Africa. However, no information on their lives is extant. DEMETRIA, commonly believed to have been the daughter of SS. Flavian (22nd December) and Dafrosa (4th January), and sister of St. Bibiana (2nd December). According to tradition, during the persecutions under Julian the Apostate St. Demetria was arrested and tried for being a Christian (363). Upon conviction and sentencing to death, St. Demetria dropped dead in front of the judge. As with SS. Flavian, Dafrosa, and Bibiana, there is a great deal of doubt surrounding the details of St. Demetria’s martyrdom as well. DOMINIC of COMACCHIO, a monk at Abbey of Pomposa in Comacchio about 67 km (41 miles) south of Venice. St. Dominic reposed circa 820. ENGELMUND, an English monk and fellow-worker with St. Willibrord (7th November) in evangelising Friesland. St. Engelmund reposed in Haarlem circa 739, and his relics are enshrined at Utrecht. LEUTFRID (LEUFROY), founding Abbot of the Abbey of La Croix Saint-Ouen in Normandy. St. Leutfrid served as Abbot until his repose 738. The Abbey was later renamed La Croix Saint-Leufroy in his honour. MAINE (MEVENUS, MEWAN, MÉEN), a native of either Cornwall or Wales, who accompanied St. Samson (28th July) to Brittany where he founded the Abbey of Saint John the Baptist in present-day Saint-Méen-le-Grand, Brittany. St. Maine reposed 617, and his abbey was later named Saint-Méon. MARTIN of TONGRES, believed to have been a hermit whose sanctity and wonderworking led the people of Tongres in the present-day Belgian province of Limberg, to compel St. Martin to become their bishop. St. Martin is generally counted as the seventh bishop of that See, and is venerated as the Apostle of Hesbaye district of Limberg. He reposed circa 350. RALPH, a member of Frankish royalty, St. Ralph renounced his temporal status and honours to receive monastic tonsure (822). He was consecrated Archbishop of Bourges 840, during the next twenty-six years, St. Ralph founded monasteries, and the energy with which he approached the care of his flock seemed endless. St. Ralph reposed 866. 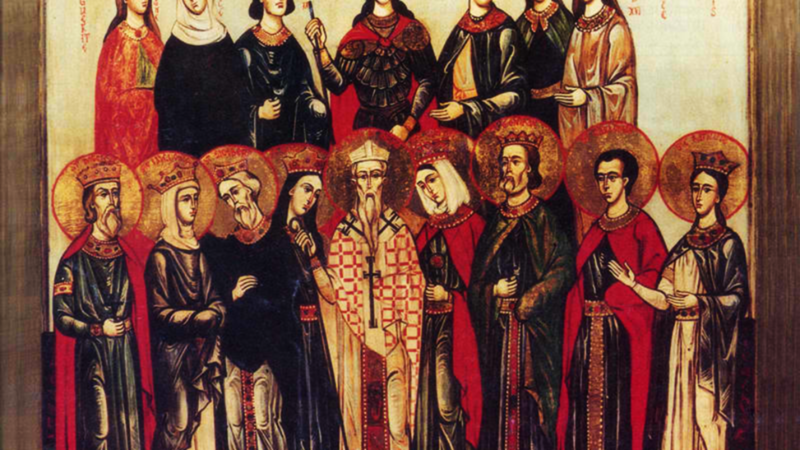 RUFINUS and MARTIA, (Date Unknown), early martyrs in Syracuse in Sicily. No further information on them is extant. URCISCENUS, consecrated Bishop of Pavia in Lombardy circa 183, St. Urciscenus led his Diocese through thirty-three years of persecution and tumultuousness. He reposed circa 216. WOLFRID, the founder of St. George's Abbey on Hohentwiel, in present-day Baden-Württemberg, Germany. St. Wolfrid reposed circa 990.